Can you spot what’s wrong with the picture in this post? 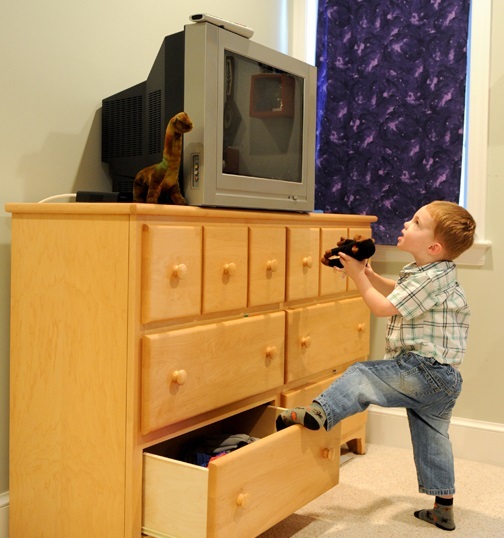 If you have young children or know someone who does, the photo should set off warning alarms – but unfortunately, many people just aren’t cued in to the danger of furniture tipovers. For example, there was an important recall notice from IKEA that you might have missed over the holidays. After an 8th child died in a tip-over accident, IKEA re-issued its recall notice for Malm dressers. A 2-year old California boy died after being trapped under an unanchored 3-drawer chest. Furniture tipovers pose a risk that goes well beyond IKEA. Every year in the U.S., more than 25,000 children are treated in emergency rooms for tip-over accidents and about one child dies every 2-3 weeks from these types of preventable home accidents. Most tipovers – about 80% – involve young children, from 1 to 5 years old. They happen in bedrooms and living rooms and involve chests, drawers, bookshelves, armoires, TVs and other unanchored furnishings tipping onto, trapping and crushing children. The little boy in the photo above is in a hazardous situation. A post on the CPSC On Safety blog explains the importance of anchoring children’s furniture. In this video clip, a Mom speaks about what happened to her son Shane and offers advice to parent so that they can avoid such a tragedy. You can also see a video of a near-miss involving twin boys who suffered a tip-over but fortunately escaped serious injury. The parents posted the chilling video online to warn other parents by showing how quickly and easily such incidents can occur when furnishings are unanchored. TV Tip Overs: Parents of small children take note! Consumer Product Safety Commission – Anchor It!